Are things in Albany about to change? We are in the middle of an election cycle where we will see turnover in all the important offices. Notwithstanding that all the candidates will be talking about reform, is change and reform what we will get in the end or will we just get be more of the same, a continuing lack of transparency, pay-to-play political contributions, and the same old mire of tangled political relationships that separate us form proceeding directly to the reforms that need to implemented? Do we really need to remind our readers that in the last election cycle, just four years ago, the candidates Eliot Spitzer, Alan Hevesi, David Paterson, also all ran on the platform of reform? Because of scandal one of those candidates, Alan Hevesi, never took office as state Comptroller, Eliot Spitzer soon resigned from the governorship in scandal and David Paterson who succeeded Spitzer is now enmeshed in is own crippling scandals that would likely remove him from office were he not so close to the end of his term and were the public not already so utterly exhausted by the scandal-driven midterm turnovers to date. Are things in Albany about to change? We think we can furnish some insight. We arrive at the perceptions we can offer by use of the singular touchstone reference which we think cuts through obfuscation and the political posture and pretense like a hot knife through butter: Atlantic Yards. We apply our test to a race for a state office which itself can serve as a touchstone, the race for New York State Attorney General. That race is a touchstone not only because of how key the office is itself, but also because it is now being vacated by Andrew Cuomo, the perceived front runner in the race for Governor, the highest office in the state, who like his predecessor, the disgraced Eliot Spitzer, has been able to use the AG’s office as the penultimate stepping stone to the highest state office. The bad news is that if the Erics are correct and that addressing these Atlantic Yards abuses should be part of the Attorney General’s job (or at least within the AG’s discretion), none of the current AG candidates are willing to say that it is improper for gubernatorial candidate Andrew Cuomo, the current holder of the AG position, to be taking campaign money from Forest City Ratner, the mega-project’s developer. That this is not improper notwithstanding the fact that Mr. Cuomo has been asked to investigate Atlantic Yards and issue rulings on the conduct by the public authorities facilitating it. That it is not improper notwithstanding the questions that lurk: Is Mr. Cuomo taking action on Atlantic Yards and is Mr. Cuomo taking appropriate action? Think of anything going on the state that is objectionable to reformers and Atlantic Yards trumps it by several shades of darkness. • Yankee Stadium investigated by Assemblyman Richard L. Brodsky? Atlantic Yards is not only a sports arena boondoggle; it is also a huge mega-monopoly real estate grab for many more acres of property. • The destruction of the Coney Island amusement area? The public realm is being sacrificed and developers are benefitting but it is exclusively a rezoning with no eminent domain land grab and the show is not being initiated and run by one single developer with the most supremely powerful of all state authorities (ESDC) in thrall to implement dictates of that developer’s every whim. • Public Authority reform? Four years ago public authority reform was one of the principle platforms that Spitzer, Hevesi and Paterson ran and were elected on, and yet during the terms that they should have been in office, (with Spitzer and Paterson being quite complicit) Atlantic Yards has provided the spectacle of new unprecedented public authority reform abuse involving multiple public authorities: the Empire State Development Corporation, the Job Development Authority, the Brooklyn Arena Local Development Corporation which was specially created by the two former agencies to circumvent the Public Authorities Control Board’s checks on abuse, and the Metropolitan Transportation Authority which violated at least the intended spirit and purpose (if not the letter) of the hot-off-the-presses (as a result of the last campaign) Public Authorities Accountability Act of 2005, (signed into law January 13, 2006) and its restrictions on dispositions of public authority property without appraisal or bid. Public officials violate that law with impunity because Bloomberg and Paterson do not instruct that it be followed and the public doesn’t have legal “standing” to challenge violations. (The state Attorney General doesn’t have to worry about not having such standing.) And ESDC and its sister agencies perpetrating Atlantic Yards even failed to adopt the whistleblower protection policy they were legally required to by virtue of previously enacted public authority reform measures. • Columbia University’s land grab in West Harlem? It runs a pretty close second to Atlantic Yards and involves a cast of characters that includes almost all the same misbehaving public officials engaging in almost all the same pretextual games to seize land, but even this is arguably a shade less awful than Atlantic Yards. All of this is to say that the issue of Atlantic Yards is clearly front and center before the Attorney General’s office. If Mr. Cuomo has not already begun an investigation of Atlantic Yards the dynamic could be very interesting when the new whistleblower-related requirement for public authorities take effect in March and are ultimately investigated (or not) by Mr. Cuomo and then by the Attorney General who is the successor to Mr. Cuomo. As we will proceed to describe, the candidates themselves provided further impressions of actions the Attorney General could be taking in responding to questions at the candidates forums. There are currently five candidates for state attorney general. They are, in no particular order: Kathleen M. Rice, the Nassau County district attorney; State Senator Eric T. Schneiderman, Assemblyman Richard L. Brodsky, Eric R. Dinallo, a former state insurance superintendent, and Sean Coffey, a trial lawyer who won a $6.15 billion in settlements for WorldCom investors in 2004 and 2005 following collapse of the company linked to accounting fraud. 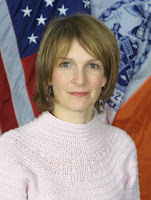 A sixth potential candidate, attorney Liz Holtzman, a four-term U.S. Representative, two-term Kings County District Attorney, and former New York City Comptroller never officially declared and decided not to pursue the office further. (See: May 25, 2010, Liz Holtzman Steps Away from AG Contest, by Celeste Katz.) 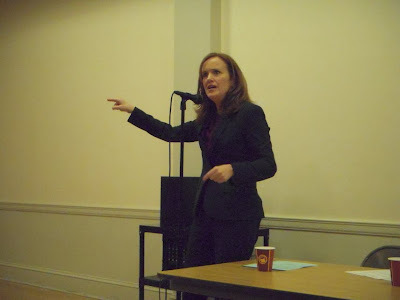 Ms. Holtzman did not appear at either of the forums we will be writing about (though she was scheduled to be at one). Our impression of the candidates are as follows. Two are extremely smart, extremely capable, extremely well-informed and savvy political office holders, one of whom is less direct and more inclined to dance with agility around the issues that are important to Noticing New York. 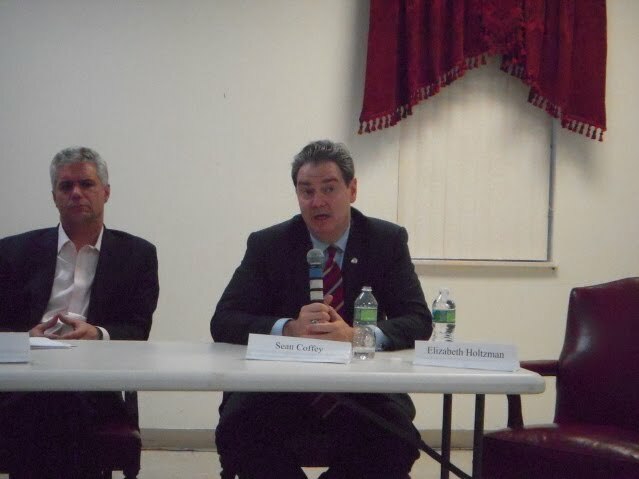 Either of these two candidates could be excellent in taking on the Atlantic Yards issues as Attorney General: One of them would probably be more likely to do so. Two more candidates are smart, competent attorneys, seemingly less equipped with as much political-insider information, whose adeptness at dealing with some of the necessary nuance is probably still at a more journeyman level. The fifth candidate comes across as an intellectual lightweight whose answers seem to come less from any personal struggle about principles vs. political pragmatism than from guesses about what others will deem is the correct response to give. We don’t think that we will need to tell you which is which: We think it will be sufficiently apparent from the answers the respective candidates give to the three questions covered in this article. While all three of these questions relate to the touchstone of Atlantic Yards we think that you would still form the same impression of the candidates by listening to the other questions asked of and answered by the candidates at the forum and you are welcome to listen in full to our tapes of the evening which you can download from the links provided. NNY: Michael White, Noticing New York. This is a touchstone question that I’d really like to put to all of the candidates although I acknowledge that you have a head start on the background. If you attain the office of the Attorney General do you intend to investigate Atlantic Yards? 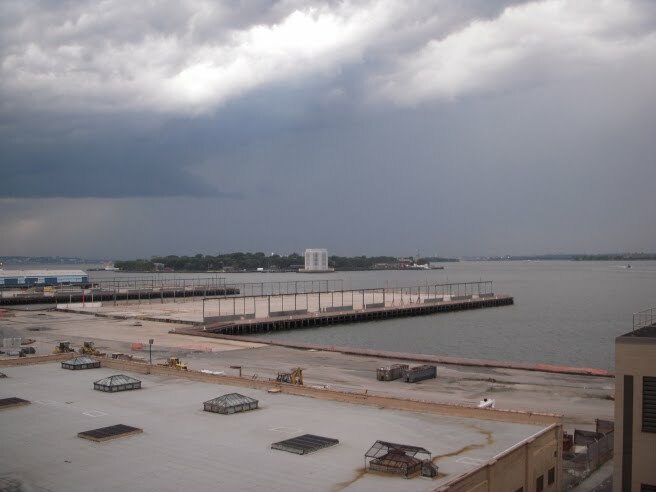 In addition, in view of the fact that Attorney General Cuomo has already received requests from a number of quarters [including State Senator Bill Perkins] to investigate Atlantic Yards [including investigation of the issuance of the bonds for the Ratner/Prokhorov arena], do you think he should be investigating Atlantic Yards? Do you think that this is something he should be turning over to Judge Judith Kaye [investigating Paterson] with other matters? Norman Oder has already laid out the parallels between Aqueduct and Atlantic Yards and shown how Atlantic Yards is worse. And should Cuomo also be returning his campaign contributions from that developer? Lastly, in view of the Ridge Hill investigation do you think, would you speculate that Atlantic Yards is already under investigation? RICHARD BRODSKY: I would not speculate on that at all. I would not advise Mr. Cuomo what he should do with his own political decisions. I will reserve judgment on the technical question of the investigation until I’m Attorney General but now I’m going to answer your question. It seems to me to me the key element in the Atlantic Yards controversy is a change in the requirements of the developer which endanger whatever commitment there was to affordable housing and whether that constitutes such a serious change, such a material condition to the agreement as to require revisiting of that. That seems to me to be both a political issue. . . It seems to me to be an issue that could be ripe for “inquiry’- that’s a different version than the word you used- as to the events that transpired and the policies behind them. A commitment to investigate people is not, in the vernacular, “chopped liver.” And I am not going to speculate and nod and wink. I have some record on this issue, unlike other candidates. I have changed the law so that elements of this deal* could not have gone forward if the law had been in place. I am conversant in the law of eminent domain and a leading proposer of amendments and change that will help communities respond to that so that what I would focus on as attorney general preliminarily is the question of whether there has been a material change in condition that rises to a level of a broader inquiry by my office. SEAN COFFEY: Thank you for the last part of the question. It really informs my answer for all of them. If there is, in fact, an active investigation going on now then it really wouldn’t be appropriate for me to comment on it. My view is that if there is evidence of wrong doing, I am going to pursue it wherever it goes. The one thing that I learned as a prosecutor is that people. . There is something called a grand jury, there is something called discretion where you don’t lay out in the front papers everything you know, all the documents you’ve received. That’s just not appropriate. It’s not fair to the potential defendants. And so whether the AG’s office has evidence of crime, how far along that is: They know that; I don’t. Based on what I know, is there something worth looking at? You know what appears to be? I have every confidence that if there is a reason to investigate, the office is handling it. In terms of everything that flows from that, returning contributions, you know, I think that is up to Andrew Cuomo and what he knows that I don’t. Because I’m sure he’s a lot smarter about the facts because he’s running the investigation. 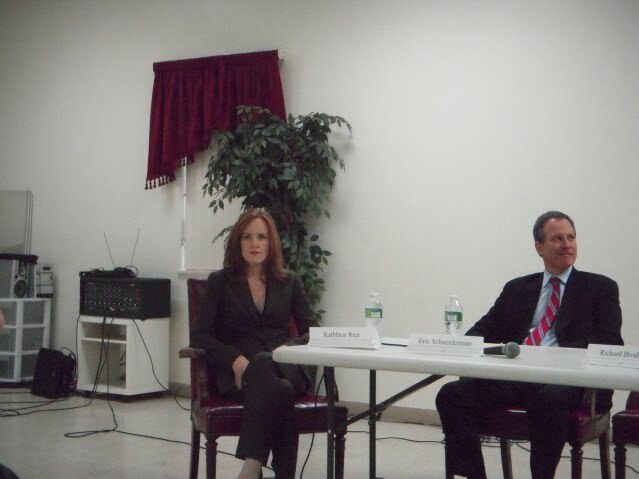 KATHLEEN RICE: Look I’m quite into the senior years of my life but I am going to try to remember every single question you asked. First, whatever referral is made to the Attorney General’s Office I will investigate, because obviously that’s the job and, regardless of where it comes from, it has to be. I don’t think there is anything that would preclude me from looking into anything that happened at Atlantic Yards if it came to the office through some kind of a referral. Anything having to do with anything that Andrew Cuomo has done or responding to anything that may or may not have come to his office, it’s just inappropriate for me to comment on. I don’t know enough of the facts. I’m not the Attorney General. It would be inappropriate for me to comment on that or anything having to do with campaign contributions. Before we proceed to the actual questions and answers of the May 6th evening, we will provide background on two things. First, when we asked our Noticing New York question at the prior March 18, forum a member of the audience remarked loudly that none of the candidates were going to criticize Andrew Cuomo because they were all conscious of the influence Mr. Cuomo would be exercising over the selection of who else would appear on the Democratic ticket alongside Mr. Cuomo. We dwelled upon this thought afterward.. There have since been some relevant stories published in this regard. The New York Times ran a May 20, 2010 story specifically about Mr. Cuomo’s efforts to control who will succeed him. (See: Cuomo Tries to Influence Who Will Succeed Him, by Nicholas Confessore.) That article described how “aides and allies of Mr. Cuomo have moved quietly and methodically to bolster Kathleen M. Rice, . . the candidate widely believed to be Mr. Cuomo’s preferred successor.” It also described actions taken by Mr. Cuomo or those working on his behalf to undermine or eliminate the other four candidates, such as a personal call from Mr. Cuomo intended to dissuade New York City Comptroller John Liu from endorsing Eric Schneiderman. Supporters of other candidates this year say it is inappropriate for a man who may well be the state’s next governor to try to handpick the state’s next attorney general. But those who know Mr. Cuomo well say he is also keenly aware of the powers of the attorney general’s office: His own investigations of Eliot Spitzer and Gov. David A. Paterson crippled both men’s political careers, paving the way for Mr. Cuomo to run for governor in the first place. A more threatening possibility is that by dictating the choice of his party for Comptroller and Attorney General, Mr. Cuomo is assuring himself that these officials, once elected, will be indebted to him and act favorably in matters in which he has an interest. The Comptroller, for example, is the state's chief fiscal officer. He certifies the budget and performs many other duties under the State Constitution. He is also the sole trustee of the state employees' pension funds, which now exceed $129 billion. The position provides many opportunities for personal enrichment, which some comptrollers have used for their own advantage. The push to put all candidates on the ballot followed an outcry among upstate Democratic leaders over efforts by allies of Mr. Cuomo’s to steer the vote toward Ms. Rice, perceived to be his favorite in the race. “They’re going to have a five-way primary that starts out with Kathleen Rice in the lead,” said Steven Greenberg, a spokesman for the Siena Research Institute, which has polled the race. Westchester Assemblyman Richard Brodsky, known for pursuit of public authorities reform and criticism of the Yankee Stadium deal (but not the similar Atlantic Yards deal), has won a key endorsement in the hard-fought race for the Democratic nomination for Attorney General. As I've written, it's widely believed that Brodsky didn't push on Atlantic Yards (despite occasional swipes at the Metropolitan Transportation Authority's failure to fulfill its fiduciary duty) so as to not offend Silver. 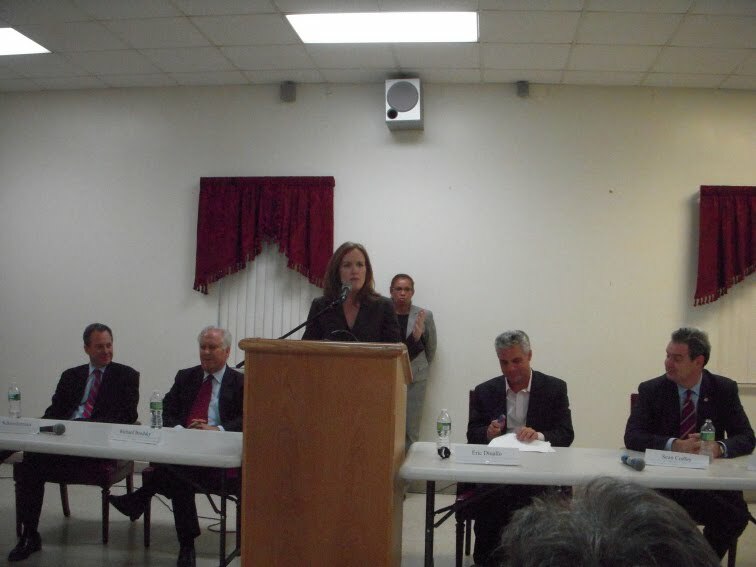 It didn’t seem that we could go to a candidates forum for the Attorney General’s race expecting to ask a question about Atlantic Yards without planning to mention Mr. Oder’s take on the endorsement in the race from Atlantic Yards-supporting Sheldon Silver. We should add that our own take is that it does not take much careful analysis before it is appropriate to conclude that Assemblyman Brodsky did not pursue Atlantic Yards anywhere nearly as aggressively as he pursued Yankee Stadium. Yankee Stadium is a good and a well-deserved target for anyone making a point about abuses by public authorities but Atlantic Yards is a far better, far juicier one. We should also note that Mr. Brodsky did excellent work on Yankee Stadium as a result of which he got, in our assessment, a lot of good press in that regard from Mr. Oder. We think Mr. Oder probably wrote more good press for Mr. Brodsky than anyone else in the state covering these issues. MODERATOR: The next question is on eminent domain. [Clapping from the audience caused the moderator to comment] (We’re against it.) It had been said that New York State has the worst record of eminent domain abuse in this country. It is one of the few states that did not strengthen its eminent domain laws after the Supreme Court’s Kelo vs. New London Decision. How do you see the AG’s office addressing eminent domain abuse? Ms. Rice? KATHLEEN RICE: This is a tough crowd: There is one right answer and one wrong answer I suppose, but the job of the Attorney General. . . You are going to hear people come up and advocate and they’re going to have very strong opinions. . . The job is that there has to be a balance, the balance of development vs. the interest of the community. And the Attorney General comes out on the side of advocating for. . . supports the community advocating for themselves. And I think that that’s the issue here because I think this is a very touchy issue here, with everything going on in Brooklyn and all around the city and we deal with it too in Nassau County. So again: It’s a balance and that’s the job of the Attorney General, to advocate on behalf of people in situations like this. And that’s what I would do. ERIC SCHNEIDERMAN: Yes, Thank you. I agree about balance but there is no question that right now the law is heavily out of balance. I disagree with the New London decision. I’m sponsor of legislation in the Senate that would change the eminent domain laws to stop this business of private interests being able to use public powers to enhance their own [inaudible]. I don’t have objections to the concept of eminent domain but that’ s supposed to be for the public good. That’s like if you have to build a bridge between two communities that will benefit people you know you may have to take some land. The idea was not to get land so someone can build a megadevelopment for a shopping mall or something else. This is just completely out of balance. Now if I’m in the Attorney General’s office- - first of all the next Attorney General because the Democrats now are in control, and I will argue, I think persuasively, that in spite of all the troubles we are going to stay in control,- - The next Attorney General’s ability to move program bills which is part of the Attorney Generals’ function, is going to be greater than it’s ever been, or been in recent history. This last year is the first year since 1937 that the Democrats have held the assembly and the senate so our opportunity to enact reform is new. I would move program bills to correct this and I would enforce them rigorously. Also, the Attorney General can also just conduct investigations into the way these projects are carried out. Because even if they are technically complying with some of the laws I assure you that there are other issues that can be raised by an attorney general willing to take a look aggressively at the way these folks are proceeding. But the most fundamental issue is: This is not a close question; The Kelo decision was a terrible decision by a conservative Supreme Court*. At the state level we can correct that. You know in Brooklyn this is what a lot of people are pointing to to say “if they can do this in Brooklyn”- - and you all have fought hard and long about this issue and it’s been a tough struggle- - but the example here is what is held up to advocates all around the state of what we do not want so I’m going to fight as hard as I can for it. I sponsored the bill and if it isn’t passed this year when I am Attorney General that will be a program bill from my office. Thank you. RICHARD BRODSKY: Five years ago - oh more- Seven years ago, I passed the first bill to reform the eminent domain system, before the Kelo issue came up because it had occurred in my county. And I’ve had an opportunity over the years to work with council member James on Brooklyn issues, and with members of the community some of whom I see here in the audience. But I want to be very clear. I have a very specific agenda for how to reform the eminent domain laws. 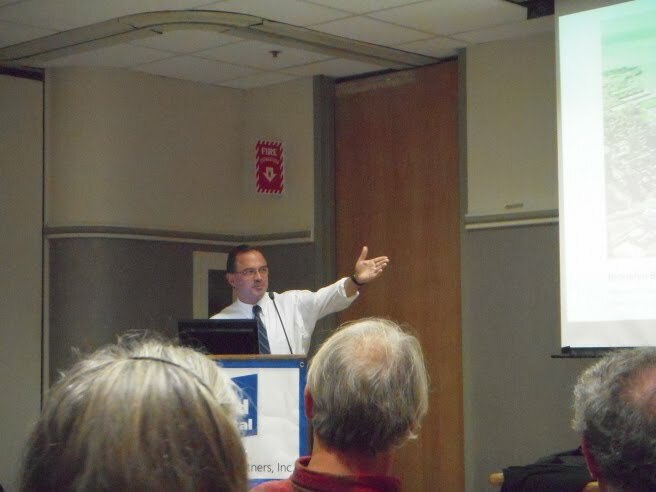 What I would urge this community and advocates to avoid is any redefinition of those laws that allow “blight” to be a characteristic of what allow eminent domain laws, the pwers to be exercised. “Blight” as we say in the old country is Yiddish for poor people. [Clapping.] And if you start a reform of blight communities, you are just going to get more of the same. Now the fact of the matter is that Supreme Court decision in Kelo was not a decision by the right wing of the court. It was a decision by the left wing of the court which was opposed by Scalia and Thomas and that wing of the court. The problem was never the decision. The problem was the state laws that essentially allowed a legislative body to transfer private property from one private person to another private person in the name of the public good. It’s baloney! The method. . The instrumentalities of that transfer are called public authorities. And we may not- I hope get a chance- since I have thirty seconds to point out that the only fundamental large reform of all these institutions in the last thirty years came out of my shop, building on the work of Al Vann, when we passed the authority reform bill which no longer would make the Hudson Yards and Atlantic Yards transactions possible. The fight about eminent domain in the end is a political fight. Yes, it’s important if you have a candidate who knows what the eminent domain laws are, but you’ve also gotta . . . need to have a candidate who will apply those laws in a political process and stop rich people frm screwing poor people. ERIC DINALLO: I agree that when I was in law school the eminent domain law was about the ability of the government to seize property at a certain market price to advance the public good and it is now transformed into a sort of private to private interest which to me is a complete change from what the court had intended and what I was taught. And what I would do is I think I would use the appeals and opinions section of the attorney general’s office to issue a revisitation of it. So I think the office now has such prominence both in the state and across the country that I would issue an opinion that would explore this again and disagree with it pretty clearly and then lead that into the signaling of a potential lawsuit around getting the laws changed and in an approach that I think should include returning back to more of a public enterprise condemnation proceeding and not a private taking. SEAN COFFEY: Well I think we all agree the Supreme Court decision was a bad one and one of a number of decisions many of us would disagree with. The question is what to do about it and legislative action is the preferred route and I support the notion of trying to support the right balance between public taking of private property for the public good, that’s what it should be about. But I think it’s a symptom of a larger problem. Why don’t we have that law on the books? There are a lot of things that are not getting done in Albany. They’re just not getting done and why not? The machinery of government in Albany isn’t working and we need to change it. We need to have new blood up there, and somebody from the outside, a number of people. We have a very successful and talented attorney general who we hope will be our new governor. He’s going to need help. I think what he needs is someone who has effected change elsewhere and I was able to do that on Wall Street in connection with many of the cases I took on. I took on the most powerful interests in this country. In the Worldcom case, seventeen investment banks, Goldman Sachs, and they tried to crush my little team with the best law firms in the country, and lots of them. And we took them to trial and got the $6 billion dollars. We were very, very tough. You need an agent of change. Just rotating people from seat A to seat B in Albany isn’t going to get you the kind of results you need on eminent domain and all sorts of other issues. So I am running because I think we need something very, very different up there: Somebody who's been a success in the private sector who's saying, `You know what, I’m going to leave the comfort of the private sector to come in and effect change.' And so, eminent domain is one example of something hat hasn’t been fixed. What hasn’t it been fixed? There are a whole bunch of things that haven’t been fixed. Doing the same things over and over and expecting a different result is the definition of insanity. It’s time for something very, very different and I believe that I offer not only something very, very different but a very, very experienced lawyer who's taken on tough assignments and is ready for the toughest assignment of all which is helping to reform Albany. Thank you. Noticing New York Asks About Maneuvering Around the Politics of Atlantic Yards: What about the Candidates and Cuomo and Silver? NNY: You’ve all spoken about public corruption and the need for transparency. I am going to name two names: Andrew Cuomo and Sheldon Silver. It has been suggested that because Andrew Cuomo will have a huge amount of influence about who goes on the Democratic ticket with him that none of you will criticize him for the money he has taken from Forest City Ratner, the developer of Atlantic Yards. Andrew Cuomo has been asked to investigate Atlantic Yards. 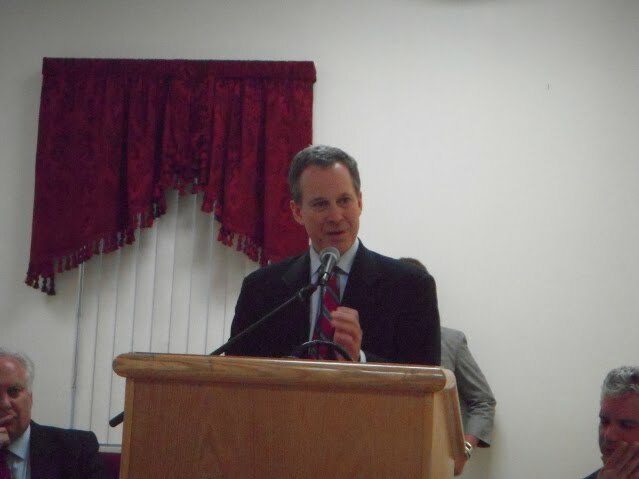 Eric Schneiderman, you said tonight that the Attorney General has that power to investigate with respect to eminent domain and investigating Atlantic Yards specifically and Eric Dinallo, you said tonight that the Attorney General should be issuing opinions and rulings that would be preventing hat kind of eminent domain abuse. Is it true that none of you will criticize him for taking those contributions and not returning them? Sheldon Silver: I think on the subject of corruption, Norman Oder has written more. . . .
MODERATOR: We need your question, sir. We’ve got the first one. NNY: . . . [continuing about Norman Oder], he has suggested although giving a lot of good press to Richard Brodsky, that Richard Brodsky went light on Atlantic Yards in order to get Sheldon Silver’s endorsement. How does the panel respond to that? MODERATOR: To Mr. Brodksy’s endorsement from Silver? NNY: Whether he went light on Atlantic Yards as opposed to the kind of good work he did on Yankee Stadium in order to get Sheldon Silver’s endorsement? MODERATOR: Thank you. Ms. Rice? KATHLEEN RICE: I can’t comment on that. ERIC SCHNEIDERMAN: I’ll let Richard speak for himself which he is capable of doing but let me mention on the first point: Look, I have never shied away from criticizing people who are bigger and more powerful than I am and I will continue to do so. Again, this does point to the issue I’ve been fighting on since I was the president of Citizens Action which is that you’ve got to get the money out of politics. Everybody. . No one believes in unilateral disarmament and I think that when there is an actual conflict of interest we have to criticize it, but, you know, until we have public financing of campaigns this is going to be plain laughable and that’s not the way to do good public policy. RICHARD BRODSKY: As the only non-Brooklynish guy who even got his feet wet in the Atlantic Yards thing, as the guy who stopped these kinds of deals from going forward in the future, as the guy who did the investigations of the MTA and held their feet to the fire on Atlantic Yards, I find the question one of those things in which you engage in circular insanity. I will not defend my integrity based upon innuendo, rumor and who I happen to have been endorsed by. If I take money from Forest City Ratner, nail me. If anybody here is taking money from Goldman Sachs, nail them. If anybody here is taking money from Leo Hindery, nail them. My record of integrity and my activism on Atlantic Yards is unique for a nonworking person. And while these are open forum and I welcome the right of anyone to ask questions, let me suggest that the endorsements I’ve gotten have nothing to do with my ongoing light on anything. It’s the first time in my life anyone ever accused me of being diplomatic. ERIC R. DINALLO: I’ve stood up to the biggest banks, the biggest insurance companies. I don’t think it’s an issue of being afraid to stand up to someone. I, first of all, don’t have all the facts in hand and secondly I agree with Senator Schneiderman: A lot of this is about campaign finance reform. You could pick across anyone’s filings and find, you know, arguable innuendo or conflict until you get public financing of these offices. As Sean said earlier, I like this sort of staged approach, and by the way I think the money would actually pale in comparison compared to the inefficiencies and ethics that surround government. You just can’t do that sort of approach in my opinion. SEAN COFFEY: I’ll answer. . . touch upon the second question first. I don’t know Mr. Brodsky well but we are doing a lot of these and from what I see he’s one of the most ethical people I’ve ever met, so I don’t know where you are getting your information or speculation but I happen to think that this is a good man. With regard to your first question, having been a prosecutor, there’s just so much that the public doesn’t know that the prosecutor knows, because they have subpoenas. So I can’t comment on whether Andrew’s gone light or not. If he has I’m quite surprised. I’m certainly not abstaining from criticizing him because I have this feeling that he’s done something wrong there. We just don’t know what he knows. And I think I answered that question the same way when you asked me that same question at a forum here in Brooklyn about two months ago. We don’t know what Andrew knows. And I will close with echoing what I said before and what some of the folks here said, which is that we need to be more proactive in draining money out of politics. I happen to believe that it is almost as bad to have the perception of a conflict as to have the actual conflict. And so we need to start somewhere. Part of the reason I am running is because I don’t think that people trust their government anymore and that’s really dangerous. And so one way to do that is to drain money out of politics. I would start with the two offices in 2014: The office with audit power which is very important, the Comptroller, and the Office with subpoena power which is the Attorney General. Let’s start there. Let’s go the extra mile. Let’s do all the other campaign financing. And if I can end with the following: I do think we are going to see change in Albany. We are because you’re going to make it happen. Every attorney general candidate is going to talk about reform. Andrew Cuomo is going to talk about reform and every legislator whose running for reelection and every legislator who is looking to replace them is going to talk about reform and they are going to have to answer:”Where are you on reform?” And what’s going to happen? You’re going to have the best chance in a generation for reform in Albany because everyone is going to have to commit to it. So let’s not just shrug our shoulders and say Albany will never change. That’s not an option. We have to do something different. Alone among the candidates, I worked with the committee members and leaders for many years to try to remove the unfairness in the eminent domain laws. I authored legislation which has been signed into law which would make below market asset sales of the kind that the MTA entered into illegal. I will continue to exercise my authority over the MTA to make sure that MTA property is not given away and that the interest of riders is the top priority. I also led investigations into New York City's use of public money to build sports facilities. No other candidate has a record on these issues close to those consistent and successful reform efforts. We will let the reader conclude how responsive this is to the characterization that Assemblyman Richard Brodsky is “known for pursuit of public authorities reform and criticism of the Yankee Stadium deal (but not the similar Atlantic Yards deal)” and is widely believed not to have pushed “on Atlantic Yards . . so as to not offend Silver.” If it isn’t responsive, then I note that the irksome thing about bloggers is that bloggers are prone to getting the last word. If it is true that if Albany is going to change, now is the best time for change to be getting underway. We are in the middle of an election cycle, just as Sean Coffey notes, all the candidates are going to be talking about reform whether or not such change is likely. Mr. Coffey tells us that he believes that there will be change, that we have "the best chance in a generation for reform in Albany," because all the candidates are talking about it and must commit to it. But four years ago it was the same thing. Mr. Coffey attributes meaning to the fact that Andrew Cuomo will be talking about change, as Mr. Cuomo indeed is. We suggest that you save yourself some time sorting through what veracity and hope can be extracted from all this. Just apply the Atlantic Yards test! How willing are the candidates to be honest about the corruption with respect to Atlantic Yards and do those candidates tell us that they are willing to do something about Atlantic Yards today? We are not talking about theoretically making megadevelopements like Atlantic Yards impossible in the future (until some new loophole or strategy for abuse is discovered): We are talking about stopping this misconduct today. Atlantic Yards is a project that will be peddling its corruption around the city and state for multiple decades. The three-day convention focused largely on Mr. Cuomo; the party’s five candidates to succeed him as attorney general were not permitted to speak from the podium, an unusual development that left some of the contenders seething. Well, if the party's five candidates to succeed Cuomo were not permitted to speak at the convention, we hope that we have made up for that unusualness here, giving you a chance to decide from their own words whether any of these candidates will bring us change. This post has been updated as of May 26, 2010. See the concluding section. Below is the Noticing New York testimony we delivered tonight at the New York City Charter Revision Commission’s hearing on the subject of the term limits issue (i.e. reinstating at least the mayoral term limits that were repealed to give Bloomberg his third term). We were the second member of the public to speak after the panel of three experts spoke. 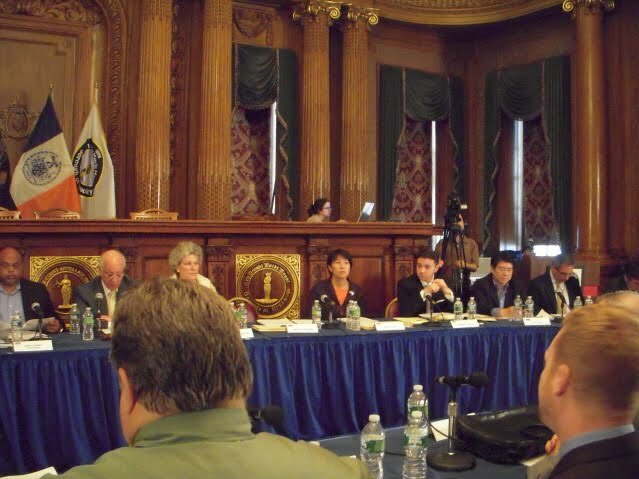 We were, we think, the only speaker who was cut off by the Commission’s chair, Matthew Goldstein. Chair Goldstein cut us off saying that testimony we were in the process of giving was not pertinent to term limits. Nevertheless, we steadfastly persevered through to completion even if we were thrown off our stride with that interruption plus consciousness of the three-minute time clock ticking down. We will let our Noticing New York readers be the judge of whether our testimony is directly pertinent to the subject of term limits. We thought we were very careful to make it so. To be fair, after the hearing, we asked Chair Goldstein what we were saying that he thought didn’t pertain to topic of term limits. He said that it was when we had talked about how consideration of the issue of term limits should not be conjoined with the issues of so-called “nonpartisan elections” and the proposed abolition of the Public Advocates office, but when we pointed out that Public Advocate Bill de Blasio (whom he had not cut off) made the same points in his testimony directly following ours, Chair Goldstein acknowledged the relationship and that he had been learning by listening to all the presentations. This comment is being offered in the name of Noticing New York, an independent entity that pays close attention to the politics and governance issues associated with New York City development. 2. What do we mean by “irony”? We mean don’t take something the public definitely favors, reimplementation of the two term limit for mayoral office to reverse the mayor’s most infamous power grab, and attempt to couple it with the reverse, something the public definitely doesn’t want; new Bloomberg grabs at power. a. So-called “nonpartisan elections.” This was previously proposed by Bloomberg and roundly rejected by the voters in 2003. So-called “nonpartisan elections” favor the wealthy and the personally powerful and could assist Bloomberg in his pursuit of presidential office in 2012.
b. Abolition of the Public Advocates office. The Public Advocates office is a sorely needed check upon the mayor. 4. Rather than using the public’s antagonism to Bloomberg’s overturn of term limits in a ruse to confer even greater power upon Bloomberg, we urge the commission to focus only on limiting the power of individuals who become mayor by restoring term limits for that office. 5. We suggest though that like the current federal system which limits the terms for president but not the members of the federal Congress, only the mayor should be term limited. Among other things this would help address the imbalance of power between the mayor and the City Council. 6. The only thing we think that would be fair to consider in conjunction with term limits is the further general check and balance on the power of incumbents, both the mayor and the members of the City Council included, that can be achieved through implementing what is known sometimes as “instant runoff elections” and sometimes as “alternative voting.” Such a change will generate challengers and assist them by making all their voices more important and will make it easier to depose incumbents. That system can be implemented while retaining party primaries and would be cheaper than Bloomberg’s idea for “nonpartisan elections” which involve multiple elections just for the purpose of runoffs which under alternative voting would become entirely unnecessary. 7. We note another reason not to term limit the City Council: Restoring two term limits to the City Council in the next (or a future) election could result in a further weakening of the City Council by forcing a one-time huge turnover in the City Council when the terms of nearly all members of the City Council thereby expire simultaneously. Yes, just when you thought it was safe to go back in the water, the issue of term limits for city officials is on the agenda again. It means that so, too, is the stain created when the mayor and the City Council subverted voters’ will to keep themselves in office for years more. Like the man who came to dinner, the term limits issue doesn’t go away. It is now in the hands of the Charter Revision Commission, which has several tasks, one of which is to convince skeptical New Yorkers that it is not a wholly owned subsidiary of Mr. Bloomberg. Whatever the commissioners decide, they will act in the shadow of the 2008 Bloomberg-Quinn maneuvering. “How they’re going to look at it is influenced by what happened,” said Frederick A.O. Schwarz Jr., who in 1989 led a charter commission that brought about the most far-reaching revisions of modern times. 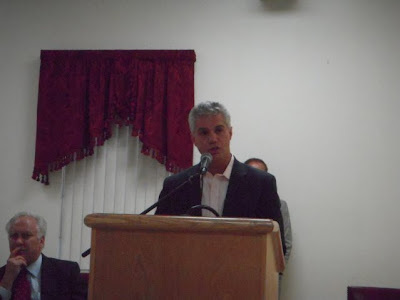 A representative speaking for Citizens Union took a position in line with Noticing New York's, that the two-term limit should be restored only for the office of mayor not for the members of the City Council. That was in line with some of the testimony offered by the testifying experts at the beginning of the hearing, one of whom noted that the council (and legislators in general) are in balance-of-power terms faced with the problem of "collective action" which should probably be the distinction that governs who should be term limited and should not. We should note that in contradistinction to Citizens Union we would be happy if the City Council were not term limited at all, rather than the current three-term cap. 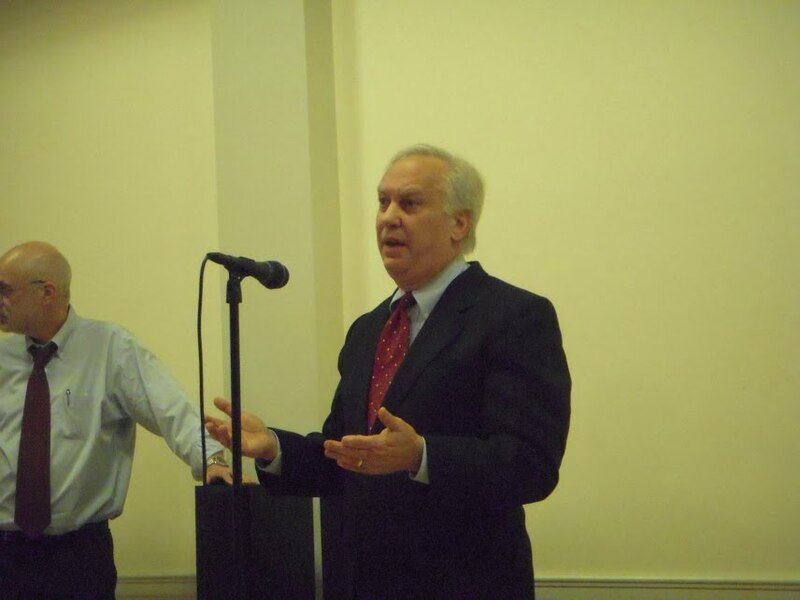 City Councilman G. Oliver Koppell was in line with us, expressing concern that the executive (the mayor) has been strengthened relative to the City Council and observed that term limits applying to both the mayor and the City Council served to accentuate relative strengthening. Speaking solicitously to the commission he ventured that he thought the "die had not been cast" in terms of what the commission would do and that the actions they would take were not "foreordained." City Councilman Jumaane D. Williams sounded more skeptical, echoing one of the concerns we were expressing when we were cut off by Chair Goldstein, when he said that specter of "nonpartisan elections" was the "doppelganger in the room that nobody is talking about." We note that no speaker other than our Noticing New York-selves spoke about the possibility of “instant runoff elections” aka “alternative voting.” Nevertheless, the experts of the evening as well as others spoke extensively about the desirability of circumscribing the disproportionate power that incumbents have in elections and their associated lack of accountability. It was also discussed how term limits does not solve the accountability problem and may actually accentuate it some regard. Alternative voting addresses both these problems. It helps circumscribe the power of incumbents in elections and simultaneously works to make them more accountable. Toward the end of the evening Chair Goldstien offered the observation for the record that he thought there had been the "most ubiquitous outreach of any charter commission" and that the outreach had even been "statewide." This was contrary to other characterizations that the commission has been operating under the radar and anecdotes during the evening, much of it from the commissioners themselves, that people were confusing the commission's work with bus rentals and the issue of charter schools in the New York City school system. We found ourselves unsettled by the technology associated with the evening in two ways. The evening was supposedly occurring simultaneously over the internet and through Facebook and Twitter. Facebook and Twitter? Really? At one point Chair Goldstein read three comments submitted via the commission's website. It seemed that this was a perfect opportunity for cherrypicking and the comments read did not disabuse us of this suspicion. The second thing was this. One of the commissioners suggested that material provided by the evening's experts should be posted on the commission's website. Chairman Goldstein said this could be done, commenting that the commission's website was "organic," that "it sheds as well as gains." That sounds like a warning to the wise: If you find anything interesting on the website you better download it today because it might not be there tomorrow! As the commission met last night, the DN City Hall Bureau's Erin Einhorn followed Bloomberg to a reception for the city Independence Party, where he said again he's not going to tell the commission what to do -- but he hopes they'll put it on the ballot. This three-part article, which is principally about the new Brooklyn Bridge Park currently under development, wends a long, more serpentine path through the politics of New York City development than perhaps any other we have written. As you would expect, Mayor Michael R. Bloomberg's appearance is much more than a cameo. We don’t offer him praise. Inevitably the metaphor of looking a gift horse in the mouth comes to mind when we contemplate the spectacular change to the city’s waterfront that will one day be Brooklyn Bridge Park. Whatever our government agencies ultimately do, the park will provide desirable benefits that will be extremely hard to complain about. But not conscientiously examining “gifts” that government officials deliver just doesn’t work in the political environment of New York. 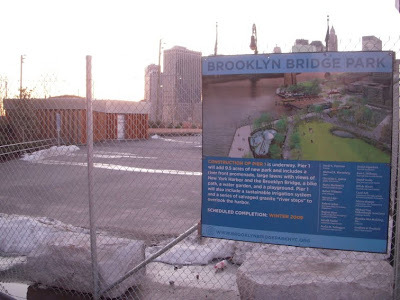 Besides Brooklyn Bridge Park is not truly a gift; it is something that community activists worked for years to obtain. Our elected representatives are, after all, supposed to be working for us. It is their job to properly administer our available public resources. Whether they are doing so requires a conscientious examination. We hope you will find that conscientious examination takes us on an interesting and worthwhile trip. Now, let our wending look at the politics of development begin. 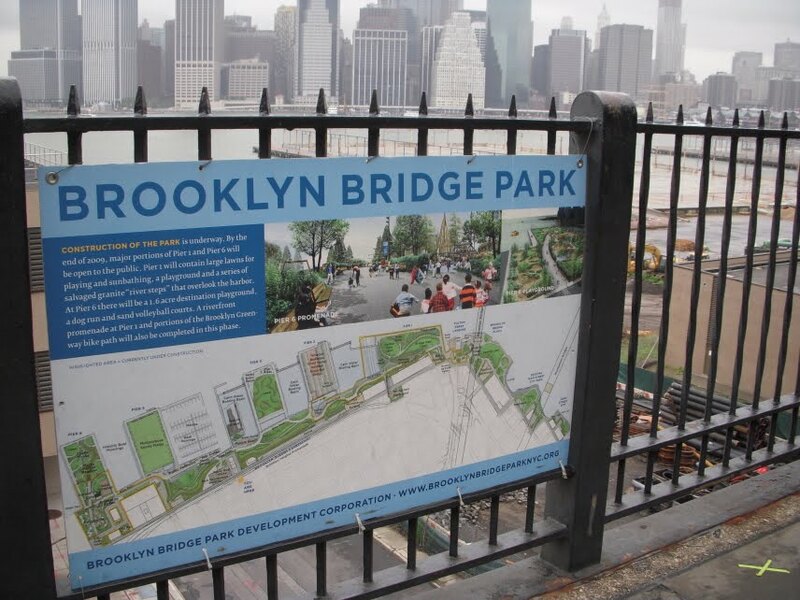 On March 22, an initial part of Brooklyn Bridge Park opened, the Pier One portion in the north near Fulton Ferry. An actual opening is imbued with a faintly amazing aspect given that dates announced for opening the park have been shuffled around by innumerable postponements. The shuffling has occurred in truly big picture terms and it also occurred recently on a more micro level. In big picture terms; the park, which involved decades of planning (funding for which was approved in 2000) was originally supposed to start construction in 2003/2004 and be fully open and complete in 2011 (an eight year construction period). By the end of 2004 the public was being told 2008 would be shovel-in-the-ground year and that the construction would take three or four years to complete (i.e. completion would be pushed out one more year to 2012). Such big picture delay is something that press coverage of the opening necessarily alluded to. The rest of the media did not, however point out the shuffling of the opening date that has been transpiring recently on a more micro level, but we did. In late August, just around back-to-school time, the public was told that two sections of the park would open just four months later in December. (We were quite skeptical.) Then, in November, with three of those four months elapsed, the public was told that it would still be waiting another four months for an opening of just one section of park rather than the two promised in August. Let us restate this in terms of what prompted our own skepticism: At the tail end of the two four year terms served by the Bloomberg administration, just as Bloomberg was running for an unprecedented third term by having overturned the city charter to repel term limits, it was being announced that part of a project funded and approved even before Bloomberg took office, the whole of which was supposed to have been largely completed within those two terms, was finally, finally being started! Not only that; the public was being told that it was going to be opened just a mere days after the election. What do you think happened? A scant 22 days after Bloomberg squeaked by (spending more than a hundred million dollars) to win re-election, it was revealed that the schedule of a four month countdown to completion announced before the election was, as we initially hypothesized, quite fanciful. The first section didn’t take four months to open; it took seven. The second section, rather than taking four months, has now taken about nine. There was a rumor that the second section might open this past Mother’s Day, but that date came and went. 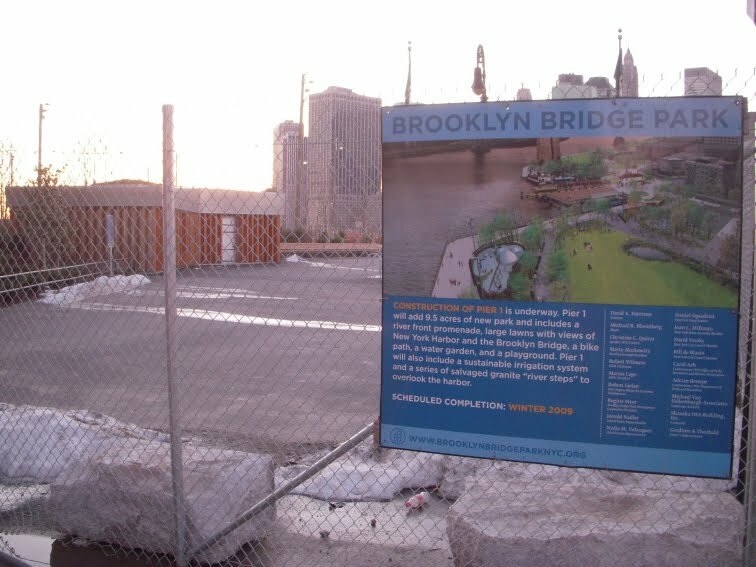 The mayor’s office was in such a rush to showcase the completion of the first phase of its new Brooklyn Bridge Park in Brooklyn that it opened it too soon. Construction crews are still installing handrails. Walkways remain unpaved. Only a few early buds are showing on the freshly planted trees. The reason that portions of the park couldn’t open sooner was that construction of the park didn’t get underway until the mayoral election season. Construction didn’t really get started until September 2009. That needn’t have been the case. Instead of waiting until Fall 2009, construction could have started at least as soon as Spring 2007, at least two and a half years earlier. At least that is what I was told by those in charge back in March of that earlier year. I don’t think this is a secret: I was interviewing for the position of President of the Brooklyn Bridge Park corporation, the position with the ESDC subsidiary now held by Regina Myer. I presume all the other interviewees were told the same thing I was. In urban planning there are always legitimate questions about how much parkland communities should have and communities do need to think in terms of how much park they can pay for and afford. But, by definition, any truly successful park has what is referred to as exogenous or external benefit. The benefit of parks cannot be defined by what can be monetized within their own circumscribed borders. In fact it is quite the reverse, if a park is doing the job, pe se, expected of it, providing substantial external benefits then, by definition, it strikes the balance in the wrong place to insist that the park to pay for itself. If Nicolai Ouroussoff is correct in assessing that the positive effect the park “will have on New York is immeasurable” and if he isn’t off-base when he equates Brooklyn Bridge Park with Frederick Law Olmsted’s (and Calvert Vaux’s) Central Park, then the park can be expected to have substantial external benefits far beyond its borders that render Bloomberg’s concept that it should entirely pay itself absurdly quaint.
. . . a 21-member private security force, with five armed officers; up to 133 staff members doing everything from hand-pruning cherry trees to teaching people how to kayak; and a fleet of 31 Toyota Priuses and dune buggies. Looking at Development Within “Two Years”? Parks officials say they are not entirely certain when the entire park will be complete. "Within two years you will see substantial completion, and the rest is we have to reach the agreements for the city to keep the funding going in,” said Parks Commissioner Adrian Benepe. “We have to reach agreements on what kinds of income will be coming in, and we still have to find more capital dollars to finish it up." City officials have said the best way to finance the park's long-term operation would be to get funding from high-end housing that could be built along its perimeter. However, that idea has stirred up opposition and the city says it's open to other suggestions. However, the expectation that housing development will be a good source of money to fund the park in the next two years doesn’t look a good bet for the public. Jonathan Miller is the President and CEO of Miller Samuel, a major NYC appraisal firm, “expects prices [for New York City apartments] to continue to slide over the next couple of years” and that slide is from where current prices are which is about 25-30% off from their mid second quarter 2008 peak. (See, without being misled by the segment’s title, NPR’s Financial 411: Apartment Sales Double in Manhattan, by Lisa Chow April 05, 2010.) Whatever a developer pays for development rights in the park in this time frame is therefore likely to be a bargain price. One reason we are now likely to see increasing city administration rhetoric about the “necessity” for housing development is because the Bloomberg administration has just acquired control of Brooklyn Bridge Park. I have enjoyed joking that Bloomberg “bought” Brooklyn Bridge Park for $55 million. Bloomberg didn’t personally “buy” the park with his own money. He took over control by pledging to spend $55 million of the city’s money that quite arguably was always going to be spent on the park in any event. At the same time, in a parallel deal, the city is also taking over control of Governor’s Island. State officials justified the move to transfer control to the city by explaining that neither Brooklyn Bridge Park nor Governors Island quite fit into the state-run Empire State Development Corporation’s core mission of luring businesses to create jobs. Change in Real Estate Industry Influence? But questions about the city’s closeness to the real estate industry could influence how these projects are funded in the future and fundamentally change how public space is used and maintained. All things being equal we would wholeheartedly support the transfers of control of the park and the island (from the shared city/state control set up under the state ESDC agency) to the city in which case we would like to see things be run by the city’s parks department. City parks are better run than the state ones in the city and the state has annoying habits: closing state parks at sundown, overmanning them, having too many rules, and threatening to close them altogether to close budget gaps. But all things are not equal, and control of the Brooklyn Bridge Park and Governor’s Island are not being put under the control of the city’s parks department. Although City Parks Commissioner Adrian Benepe has been used to help put a parks department face on the city’s plans, when he was asked the more moderately difficult questions about the Brooklyn Bridge Park at a December 7, 2009 Brooklyn Bridge Park Town Hall Meeting hosted by state senator Daniel Squadron where the city takeover idea was fielded, Benepe kept referring the questions to more somber city development officials standing behind him, the same development officials responsible for city development plans at Coney Island and Willets Point. When “parks” are in the hands of "development officials" instead of parks professionals one has to have a concern about development bias. For instance, under the auspices of development officials charged with making the Coney Island amusement area a successful amusement park, more and more of that acreage was disappointingly and steadily turned over to additional development uses over the course of decades. The politics with respect to Brooklyn Bridge Park have been tipping. Most understand that the election of state Senator Daniel Squadron, deposing long time senator (and former Senate minority leader) Senate Marty Connor reflects the Senate district’s preference not to have development in Brooklyn Bridge Park (as well as other related things like opposition to Atlantic Yards). With the 2010 fall election of a new, strong governor like Andrew Cuomo this tipping could have meant the demise of plans for development in the park if the city and state continued to share responsibility for it. One thing that the transfer of control of the park and island clarifies for Bloomberg watchers is what Bloomberg intends with respect to his plans for a second run for the White House: He probably is not thinking of running for New York State governor as a stepping stone. 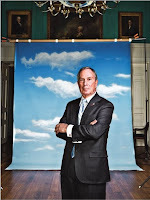 When Bloomberg started gearing up his political career in 1997 he wrote in his book released that year that he would be a great “mayor, governor, or president.” (See: Friday, October 2, 2009, No Real Debate About It: Press Remains Way Off Track in Presupposing Bloomberg’s “Charity”.) No one has every gone successfully from being mayor of New York City to being president but many have successfully gone from being Governor of New York to being president so it is was reasonable to assume Bloomberg was considering a short spell as a “great” governor as a stepping stone but the transfer of control away from the governor's office argues against this. The other thing that ought to convince Bloomberg watchers that Bloomberg plans to head straight to Washington, bypassing Albany, is the way that he is restructuring his “charitable” giving. In Bloomberg’s book he explained that his (first listed) criteria for making “philanthropic” gifts was the way in which such gifts will be to his own benefit. His charitable “giving,” which commenced at the same time as his political pursuits, was put under his newly hired chief political tactician, Patti Harris (picture on left). Up till now, when Bloomberg was pursuing his three successive terms as mayor (including the term limits override that made the third one possible) Bloomberg doled out hundreds of millions of dollars to charity (well over a billion) and those charities had a New York City focus. Mayor Michael R. Bloomberg, New York City’s richest man and biggest philanthropist, is quietly pulling the plug on an unusual program that has poured nearly $200 million of his fortune into nonprofit groups across the five boroughs, in a sign of major change under way in his charitable giving plans. He is increasingly focusing on his charitable efforts at his family foundation, where he has expanded hiring and operations in recent months as he prepares to put greater emphasis on needs in the United States. The gifts reflect the often blurred roles Mr. Bloomberg plays in the city as mayor, tycoon and philanthropist. And while the donations earned him praise from grateful recipients, who regarded him as an enlightened billionaire, they also drew rebukes from elected leaders who argued that he bought political acquiescence with his checkbook. 8. Maya Lin, the Asian-American architect whose best-known work is the Vietnam Veterans Memorial in Washington, D.C.
11. Sam Nunn, former Democratic senator from Georgia with national defense credential and who was twice thought to be under consideration as a presidential running mate. Thompson’s defense meant that he and the mayor were pointing fingers at each other, each saying that the other either 1.) had the responsibility (all of the “buck”), or 2.) was at least supposed to be acting as a check against their own abuse. Bloomberg and Thompson were supposed to be a check and balance for each other? What came out after the election was that Bloomberg and Thompson were far cozier than almost anyone knew: “The mayor has directed or triggered between $43 million and $51 million in public and personal subsidies into a museum project led by Thompson's current wife and longtime companion, Elsie McCabe-Thompson, dumping $2 million of additional city funding into it as late as September 30, in the middle of the mayoral campaign.” (See: Bloomberg and Thompson: The (Really) Odd Couple, Now it can be told: The surprising ties between the billionaire mayor and the poor slob who ran against him, by Wayne Barrett, January 05, 2010.) So much for the idea that the two men were a check and balance against each other. 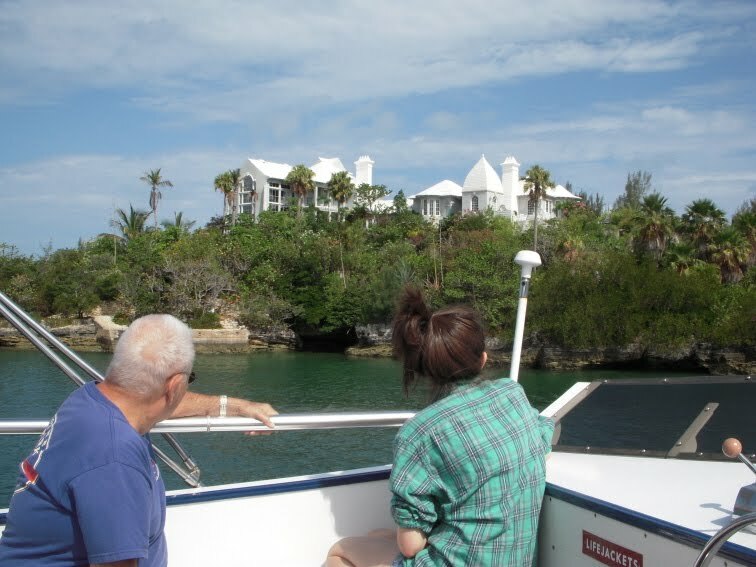 But when it was time for reporters' questions, the topic turned to the transparency of the mayor's charitable foundation, which invests hundreds of millions of dollars in legal but controversial off-shore tax havens, like the Cayman Islands. Sara Kugler of The Associated Press asked Bloomberg if that contradicts his call to keep the financial sector within the United States to employ people and pay taxes. "Doesn't it kind of go against this message you’re arguing here for you to allow your investments to be made in off shore --"
"--I don’t have anything to say about my investments," the mayor said. "You signed those tax forms, so you had to…," Kugler continued. "I did not sign those tax forms," Bloomnberg said. "Well, that’s your signature on it," Kugler pressed. "If they're tax forms that I signed, I signed," the mayor said. "But I don’t have any control over where my investments go. And incidentally, as far as I know the investments that my money managers make are perfectly legal. There’re fully disclosed and they’re appropriate to maximize the assets which I’m giving away to charities." Bemused By Bloomberg in Bermuda? It is hard to resist mentioning that while Bloomberg’s investments are offshore, Bloomberg, himself is also something of an offshore mayor. While the Village Voice has reported cribbing from Joyce Purnick's Bloomberg book that Bloomberg departs the city leaving from City Hall "almost every" Friday morning "spring and fall" "at 11:05, the latest" to travel to his home in Bermuda, the Times hedges a bit and says only that the early Friday departure is set up as Bloomberg’s default schedule and that Bloomberg may only actually leave for his extended Bermuda weekends every other week. As for actually knowing whether it is either the Times or the Voice that is more correct, it is difficult to say because as the Times reports: "He steadfastly refuses to say when he is on the island, and to blindfold prying eyes, he has blocked aviation Web sites from making public the movements of his private planes." (See: New York’s Mayor, but Bermuda Shares Custody, By Michael Barbaro, April 25, 2010.) That’s New York’s steadfastly "transparent" offshore mayor. For our own particular take on just how green Bloomberg himself really ISN'T, see: Monday, November 2, 2009, On Your Way Vote, We Quizzically Ask: How "Green" Is Our Bloomberg? HP: Wolfson's connections to national politics are likely to revive questions about whether Bloomberg may still have White House aspirations. NYT: The appointment of a presidential-level strategist is likely to renew speculation about whether Mr. Bloomberg, a billionaire, still harbors national political ambition. He flirted with a presidential run in 2008, but decided it was not viable. A person close to the mayor said Mr. Wolfson would play “a key role in developing policies and lead in selling them.” He is likely to focus on promoting national issues like gun control* and immigration reform, a priority for Mr. Bloomberg. This is the end of Part I of this piece. To read more about Brooklyn Bridge Park and the city politics that interplay with development (beginning with Mr. Wolfson’s involvement with Bloomberg-styled “nonpartisan elections”) click here to proceed to Part II.